I work with a product called Precious Metal Clay. The material consists of microscopic particles of pure silver which are extracted from waste products such as fillings from teeth (! ), discarded X-ray film and photographic film. This is mixed with a water-soluble, non-toxic, organic binder which burns off during firing. The result you are left with is 99.9% pure silver. This is purer than Sterling Silver and also takes much longer to tarnish. All in all a very eco-friendly product! 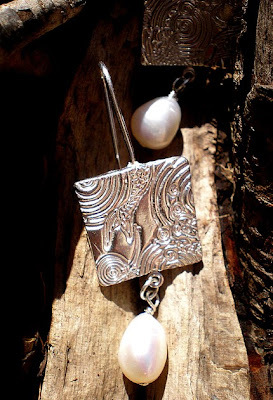 I make a variety of jewellery including pendants, earrings and brooches. However, by far my favourite thing to do is to immortalise leaves in silver. I do this by coating a real leaf in layers of liquid clay. 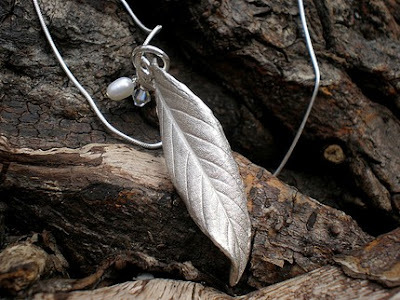 When fired, the leaf burns away and the imprint is left in the silver forever. The leaves can also then be made into a pendant or charm. When done on a leaf from a bridal bouquet it is a beautiful and unique gift or keepsake for a bride or bridesmaids. All of my silver jewellery is tested by the Scottish Assay office and stamped with a full set of Scottish hallmarks (my unique mark, the Edinburgh Castle mark, 999 purity mark) so my customers can be completely confident in the purity and quality of the silver I use.